Gwynedd Archaeological Trust partnered Oriel Ynys Mon to set up an exhibition entitled ‘Celebrating Anglesey Archaeology'. It followed on from a Llyn Cerrig Bach exhibition which was undertaken by the Oriel in partnership with the National Museum of Wales. The exhibition showcased the collection of finds from the recent Tai Cochion excavations to illustrate modern archaeological processes. The exhibition followed the process of archaeological discovery, assessment, excavation and publication, and based the process flow around the Tai Cochion project, taking the process from initial discovery by the reporting of finds through PAS, through assessment and evaluation, excavation and post-excavation/publication phases. 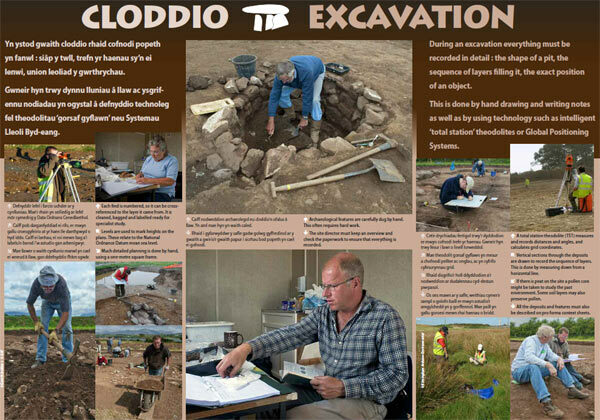 The aim of the project was to raise awareness of archaeology and its vulnerability and to explain the process by which sites are discovered and investigated. The Trust was helped in the preparation of the exhibition by Robert Williams and Philip Steele, who work closely with the Oriel preparing their exhibitions and publications. A booklet was produced to accompany the exhibition. The exhibition was opened by Dr Kate Roberts (Cadw) on 17 November and continued through to February 2013.